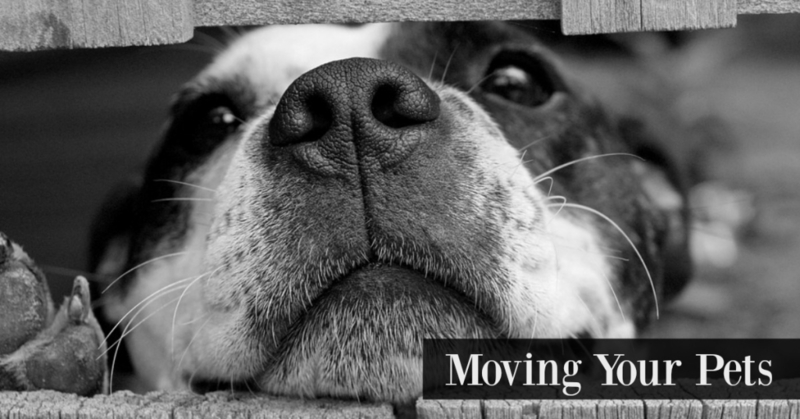 While your dog or cat won’t have the final say on where you move, keep in mind the needs of your animals when choosing a house or apartment. Are they older? Then having a bunch of stairs probably wouldn’t be ideal for creaky knees. Also, it probably wouldn’t be prudent to have to take a puppy who isn’t house trained down a flight of steps to go to the bathroom. Believe me, I have been there. Me and my wife got a new puppy in our old condo and it was a pain to take him out every ten minutes to see if he needed to go to the bathroom. For those of you with skittish animals, bringing in the moving boxes early will help them acclimate to the moving process. On moving day, keep the animals locked in one room so they can’t get away. If there is a long drive involved in the move, make sure your pets can get comfortable with a crate. Many dogs and cats aren’t used to them, so get started early. Put their food in the crate and have them eat their meals inside. Also, try carrying them around the house in the crate just so they feel comfortable when its time to be inside during a long trip. When you are finally inside your new home, don’t let the animals just wander around to explore. Choose one room where they will be most of the time and put treats, food, water and beds in there to let them know this is a safe haven. After they seem comfortable in their new room, slowly introduce them to the rest of the house while keeping some doors shut. For those with cats, try moving the litter box to a more permanent location slowly over time. Perhaps the most important tip of all can be seen in the movie “National Lampoon’s Vacation”. When you stop the car to stretch your legs and have some lunch, never tie your animal to the bumper. And don’t eat soggy sandwiches.